15 Minutes is no place for talented actors. HERE'S an important message about violence in the media, brought to you by Time-Warner-AOL and its New Line Cinema division, creators of the Nightmare on Elm Street franchise. 15 Minutes, director and writer John Herzfeld's follow-up to the equally shoddy 2 Days in the Valley, seems to be a re-creation of mid-1980s Golan-Globus grindhouse fare. It's an uneasy mixture of titillating violence and New York Post editorial page-style denunciation of crime in the streets. A previous example of this brand of kibble is Cannon Films' 1987 Street Smart with Christopher Reeves. Here it is again: the "realistic" exposé of criminals pampered by the justice system, combined with wholly fictional adventures of supernaturally apt murderers, who are about as subject to the laws of physics as Superman. Yes, Robert De Niro is in this movie, but his qualities as an actor can't help a part meant for Charles Bronson. Fast and loose is the only way to play this kind of potboiler, which veers from splattery violence to lame social commentary. 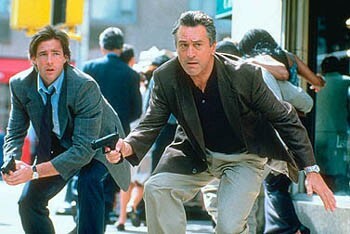 De Niro, trying to give the film weight, especially during a torture scene, just pulls the thing off its hinges. At any rate, De Niro's on-screen for about 30 minutes of this movie, playing a celebrity NYPD homicide detective named Edward Flemming. The well-known cop teams up with a wet-behind-the-ears arson investigator (Edward Burns, who's getting worse). Their quarry is a pair of Slavic killers: the Czech Oleg (Oleg Taktarov) and the Russian (Karel Roden, who makes his debut suffering from delusions of Gary Oldmanism). At first, the foreigners are just looking for their cut of a robbery; then they decide to become famous outlaws and get their "15 minutes" of fame. The movie-mad Oleg, who likes to pretend that his name is "Frank Capra," steals a video camera and films the pair's crime sprees. In a bit of business none could have anticipated, the videos become evidence against the criminals. Yet thanks to their careful study of tabloid television, our villains try to escape prosecution with an insanity defense. "I love America!," Roden chortles, outdoing Yakov Smirnoff. "No one is responsible for what they do!" This deep thought is later underscored in case we miss the point: "You Americans are pussies!," the ex-Soviet sneers under the Statue of Liberty on the horizon. Americans! Are you going to take this Russian insult lying down, or are you going to avenge it with a hail of bullets? The despicable 15 Minutes doesn't work either as social commentary (not enough brains) or as entertainment (not enough moviemaking skill). 15 Minutes is, however, notable as the first real cinematic expression of the Bush II era, in which alarmist rhetoric and foreigner hatred are played as simple common sense. From the March 8-14, 2001 issue of the Northern California Bohemian.